New SAM for Troop Air Defense? The spokesman said it’s planned to complete experimental-design work (OKR) on the new system this year, and procure up to 250 of them under this year’s state defense order. He said the systems will go into the SAM batteries of air defense battalions of independent motorized rifle and SAM brigades. The new SAM will be deployed on mobile platforms that support automated remote launches. In his estimation, as a result of this, an increase in the combat capabilities of PVO troop groupings of up to 40 percent, according to a number of indicators, is expected. 40-50 Percent of State Defense Order Simply Stolen in Recent Years . . . no wonder large-scale procurement hasn’t happened. Serdyukov supporter Korotchenko tries to paint opponents of military reforms as people trying to protect their corrupt schemes. This surely goes on, but there also have to be people opposing them for reasons other than greed. Finally, it’s at least conceivable that, if Serdyukov doesn’t make progress against corruption, it could cost him his job (if he stays that long, he is approaching the four-year mark). Thus endeth the precis for this post . . . This week Profil investigates military corruption. 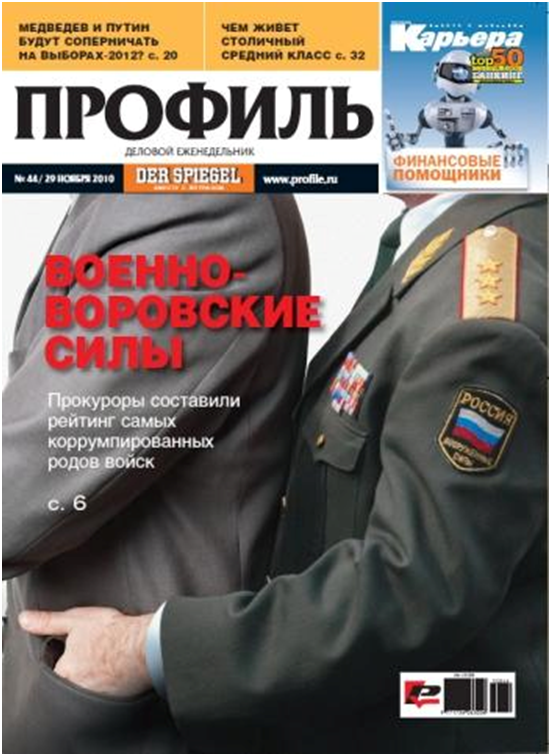 The magazine notes the number and scale of Defense Ministry corruption cases is growing by leaps and bounds, reaching losses of 2.2 billion rubles for the first ten months of 2010. It concludes, despite a significant cut in the officer corps and Defense Minister Anatoliy Serdyukov’s battle against “thieves in broad stripes [generals],” the number of corruption crimes is not only not declining, but has substantially increased. Profil obtained an analytical report compiled by the Main Military Prosecutor (GVP) showing who has stolen how much this year. Profil’s first graphic . . .
Profil suggests the recent wave of military retirements signed off by President Dmitriy Medvedev could have been sparked by corruption charges. While possible, there’s no evidence to support this thesis. A very good point, Mr. Pukhov. Yes, the results of this little anticorruption experiment are very much influenced by where and how it is being conducted. One should also pay much more attention to the absolute numbers of corruption cases than the percentage changes, and nothing has been said about the relative size of the various parts of the armed forces . . . no per capita figures are provided. Are 44 crimes in the relatively small Space Troops more significant than 152 in the larger Moscow MD? Korotchenko, a fairly strong Serdyukov proponent, says the Defense Minister and his tax service colleagues are beginning to break existing corrupt ties, institute financial transparency, and deprive the generals of the right to conclude any contracts. Dividing the Ministry into military and civilian halves will keep military men out of financial expenditures, and this “process of shifting generals out of the feeding trough” will continue until 2012. The generals will provide requirements, and civilians will allocate the financing. A second graphic with some absolute figures on losses due to corruption . . . So, Korotchenko asserts most conflicts over army reform are banal conflicts of interest for those who can’t steal like they used to. But didn’t the GVP just say they’re doing a better job of stealing than ever before? But he believes the Kremlin knows no one can fight corruption like Serdyukov, therefore the GVP report isn’t a real blow to him. 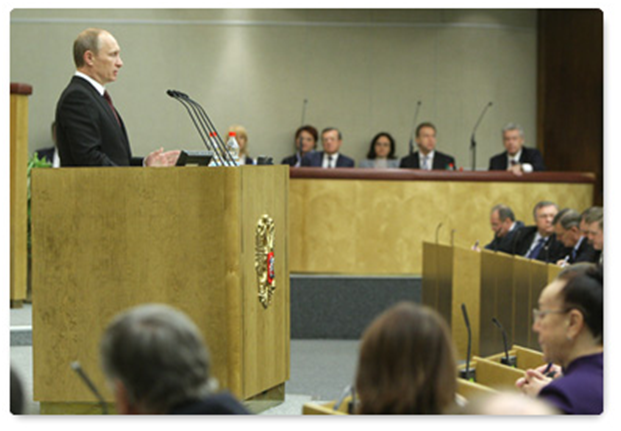 Yesterday Prime Minister Vladimir Putin reported on the government’s work over the last year to the State Duma. His remarks focused on government efforts to handle ‘bread and butter’ economic and social issues during the 2009 crisis. There was relatively little on military issues, except for some remarks on defense industry and military housing. He largely reiterated familiar themes like increasing modern weapons to 70-80 percent of the inventory; he congratulated those working on the fifth generation PAK FA and he emphasized development of a new strategic bomber. Without being too specific, Putin suggested that OPK enterprises with heavy tax arrears might be getting some relief. On housing Putin promised almost 52,000 military apartments this year. But Duma deputies didn’t ask him about press reports that many of the 45,600 built last year remain empty because of construction defects, bureaucratic red tape, and even the fact that some were not really built in the first place. Putin reiterated an earlier promise to house servicemen who didn’t get apartments in the first post-Soviet decade. And he noted that privatization of service housing remains a possibility since the deadline has moved back. First Putin’s description of the economic scene. Putin said Russia’s GDP fell a record 7.9 percent, and industrial production declined 10.8 percent last year, but the government responded by greatly increasing budget expenditures—27 percent more than in 2008—even though revenue declined almost 21 percent. Putin said the government used Russia’s accumulated reserves to finance the shortfall. It spent 5 trillion rubles—1 trillion more than in 2008—on pay, pensions, social benefits, education, health, and housing, according to Putin. He said 1.65 trillion rubles were invested in ‘developing the economy.’ Putin concluded that most of the government’s anticrisis program, the use of the budget, reserves, Central Bank resources, and state guarantees worked, and prevented the destruction of the real economy and the financial system. On military housing, Putin first addressed war veterans in line since before 2005. He said 28,000 of these veterans have been housed, and he wants to house any who were left out or joined the queue later. The government has directed 34.5 billion rubles at this, according to Putin. Just to complete this picture, Deputy Defense Minister and Chief of Housing and Infrastructure, Grigoriy Naginskiy, recently admitted that only 21,061 of those 45,600 apartments from 2009 are actually occupied because of poor construction and problems formulating ‘social lease contracts.’ But Naginskiy promises that 99 percent of the 45,600 will be occupied before 1 June. That’s quite a promise. Viktor Baranets has written recently about builders’ efforts to ‘economize’ and squeeze out extra profits on military apartments. Olga Bozhyeva has written about servicemen turning to the courts over housing issues, as well as ‘virtual’ Defense Ministry apartments that don’t exist. The Main Military Prosecutor has actually investigated cases of this in Chekhov. To round out the economic picture, Putin asserted that signs of recovery include a forecast of 3 percent or more GDP growth for 2010, and industrial production growth of 5.8 percent and real income growth of 7.4 percent for the first quarter of the year. Vasiliy Burenok told a round table at the ‘Army and Society’ exhibition in Moscow Friday that the current pace of Russian force modernization, not more than 2 percent, won’t support the transition to a ‘new profile’ military. 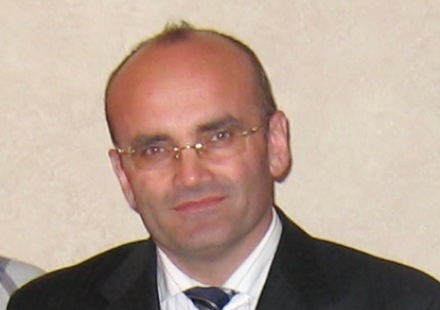 Burenok is Director of the Defense Ministry’s 46th Scientific-Research Institute (46 NII). The 46 NII is a lead organization involved in formulating the State Armaments Program (GPV) and State Defense Order (GOZ). It works on military-technical policy documents and program planning methodologies. Burenok is a member of the Scientific-Technical Council of the RF Government’s Military-Industrial Commission (VPK). Reviewing history a bit, Burenok told his audience, at the beginning of the 1990s, the rearmament rate was 5-7 percent annually. But, between 1991 and 2000, financing for new arms and equipment declined more than 50 times, leaving only enough money to maintain existing weapons. Burenok concludes to get the army to the ‘new profile’ it’s essential to introduce 9 percent new equipment every year, and for some services and combat arms, up to 11 percent. This 9 to 11 percent is, of course, the difficult target President Medvedev set at the Defense Ministry Collegium. Burenok indicated just how difficult–going from less than 2 to an 11 percent annual renewal rate. Armaments Chief and Deputy Defense Minister Vladimir Popovkin also addressed the ‘Army and Society’ round table. He said GPV 2011-2020 will go to the president for approval in June. The new GPV will be accompanied by yet another new Federal Targeted Program for OPK Development. Popovkin said a number of systems won’t be produced under the new GPV. 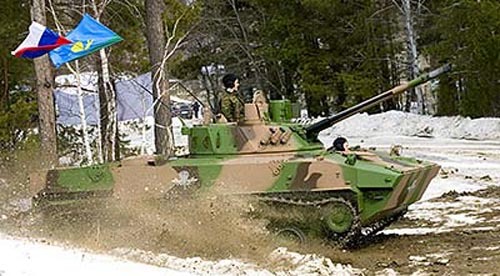 They include short-range tube artillery, and BTR-80, BMP-2, and BMP-3 combat vehicles that soldiers are afraid to ride in.